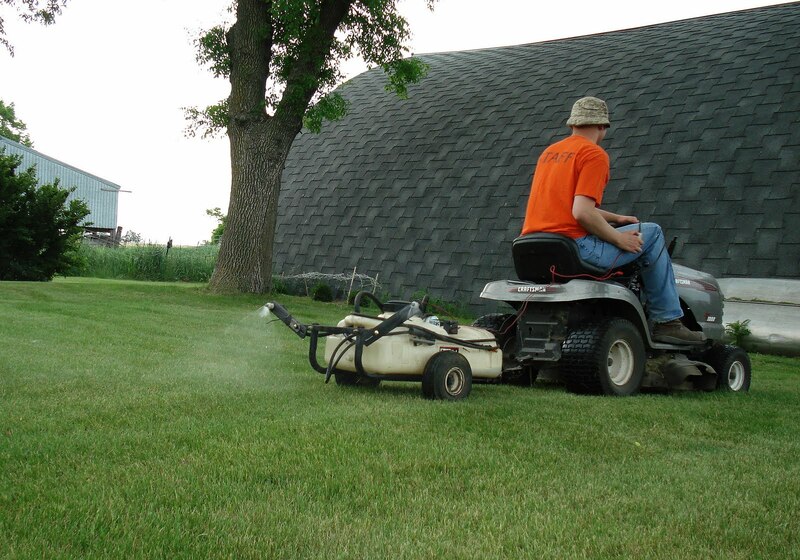 If they can break away from field work, farmers generally have large lawns to maintain. Above: Rob is in the foreground, pulling a sprayer with a riding lawn mower. He is working to get rid of the dandelions. Joe is in the background. 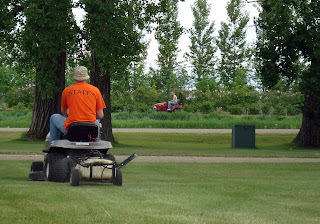 He is on our Case IH riding lawnmower, mowing our shelter belt "park" across the gravel road. As Rob's shirt points out, they are the yard staff. Above: Another view of the sprayer system we use. Rob has a switch in his right hand that turns the sprayer on and off, so he can avoid spraying areas he doesn't want hit. Above: Joe is mowing an area in the shelter belt park. The old building in the background used to be used as a potting shed. As you can see from the yet to be mowed grass, we have plenty of dandelions! Please travel south and come to our lawn. Hunter is going to attack the grass today with the mower. 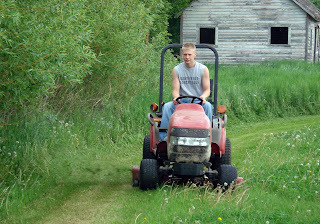 And he has a bit of Robbie in him because the last time he mowed he ran into the corner of the house when he was trying to park the mower.